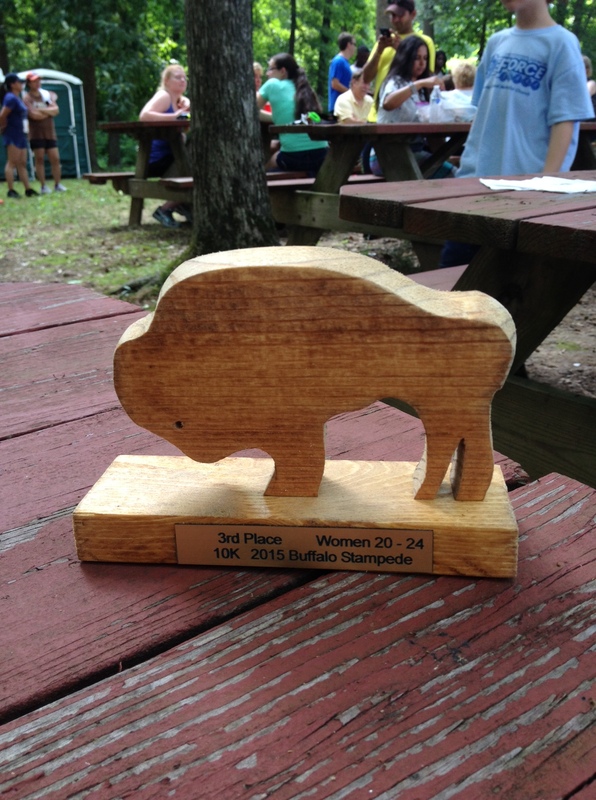 Seeing the cool prize at the Great Wyoming Buffalo Stampede drew me to the race, and I got to leave the event with my own wooden buffalo. I looked at last year’s winning times before registering and figured I’d have a better shot at winning a buffalo for the 5K, but I wanted to run the 10K — I would be driving more than an hour to get to the race, and that way I’d get a longer run in, get to see more of Wyoming and get additional experience with the 10K, as I hope to run one in less than 50 minutes this year. And what if all the faster people decided to run the 5K, and then I still didn’t get one? The Buffalo Stampede was hot. I stopped at every water stop, and after the first stop, where I drank one cup of water, I asked for two cups at each water stop and poured one on my head and drank the other. I walked for a little bit at each water stop, and a couple or so other times. Given my past experiences with dehydration, my main goal was to finish the race healthy and without needing medical attention, and I succeeded. It was fun to run through Fifer Orchards during the run, and I stopped there after the post-race party to buy some apple cider doughnuts and produce. During the run, on my way back, I felt like Mile 5 seemed extra long. I felt like I’d seen the Mile 4 sign a while ago, but I had not seen a sign for Mile 5. I did see the two-mile mark for the 5K — which would have meant 1.1 miles were left — but I never saw the Mile 5 sign. So, seeing the Mile 6 sign was a huge relief, and I knew I’d only have 0.2 miles left to run. I felt like I kicked up the speed at that point. I enjoyed a couple peaches afterward at Wyoming Park, which has a nice lake, and then made my way over to the party at the nearby Moose Lodge, where there was a live band and awards were given out. In addition to the award, I like the tech shirt I received with a running buffalo on it. This race, put on by the Downstate Delaware Striders and Riders, also only cost $20 for me to enter, plus the online fee. I would like to return to this race, though I might give the 5K a shot, because of the heat. We’ll see — I may be interested in the 10K again by the time next summer rolls around. Note: This post has been updated to correct the amount I spent on the race entry.